For me, getting around without a car is much easier than most think. 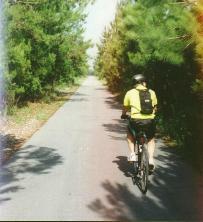 To start with, it is usually a good idea to live in a college town, where one typically finds relatively good facilities for walking, bicycling, and transit (which tends to be coupled with the “safety in numbers” benefit: studies show that when a lot of people are bicycling, it is much safer — and more enjoyable). Because Boulder, Colorado is relatively compact in terms of where places are located (and is not overloaded with high-speed, multi-lane roads that are too dangerous to bike), it is fairly easy for me to get nearly everywhere I need to go by bike. Or walking. If distances are too long or weather is unpleasant, there is a great bus system here (best of any city the size of Boulder in the nation, and I have a free bus pass). And when there is no bus service, it is easy for me to share a ride with someone else going to the same place. This is particularly easy when I am in a relationship and my significant other and I are sharing her car and its expenses. I have never had to do this, but another option is the growing availability of car-share companies such as Zip Car or Uber. Why did I choose to be car-free? Well, it makes me quite secure, financially (I was able to retire at age 47!). Cars cost a lot more money than most realize. In addition, when I drive a car, it induces stress, high blood pressure, and hostility in me. So I feel those things much less by not driving. Also, I am naturally more physically fit by not driving (a big cause of our obesity epidemic is excessive car travel and resulting inactivity). 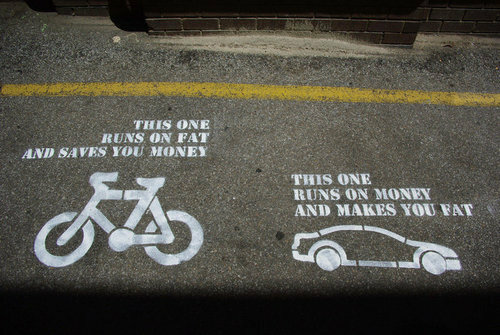 I like the fringe benefit that bicycling or walking puts me in a happy mood. And I am able to be much more sociable than if I am inside a high-speed metal box. In sum, I was MORE than happy to trade off a slight increase in travel inconvenience for all of the benefits I list above. I often wonder why so many Americans have NOT made the choice I have made. What is Causing the Fierce Opposition to Right Sizing Folsom? In my opinion, there are three things that are primarily creating the extreme opposition to right-sizing Folsom Street in Boulder, Colorado. When people travel inside huge metal boxes, they inevitably are slowed down on roads, even if there are only a few other metal boxes out there (because the boxes take up so much space). The result is that pretty much every time a person drives a car, they are frustrated by being slowed down, so for their city to deliberately slow them down even MORE is an outrage! The local newspaper has spun this project to make it seem like there are only trivial, inappropriate reasons to do the right-sizing: slightly widen existing bike lanes, and FORCING EVERYONE to stop driving and start biking. This spin understandably provokes rage, as the benefits seem minor and only benefits a tiny number of people. 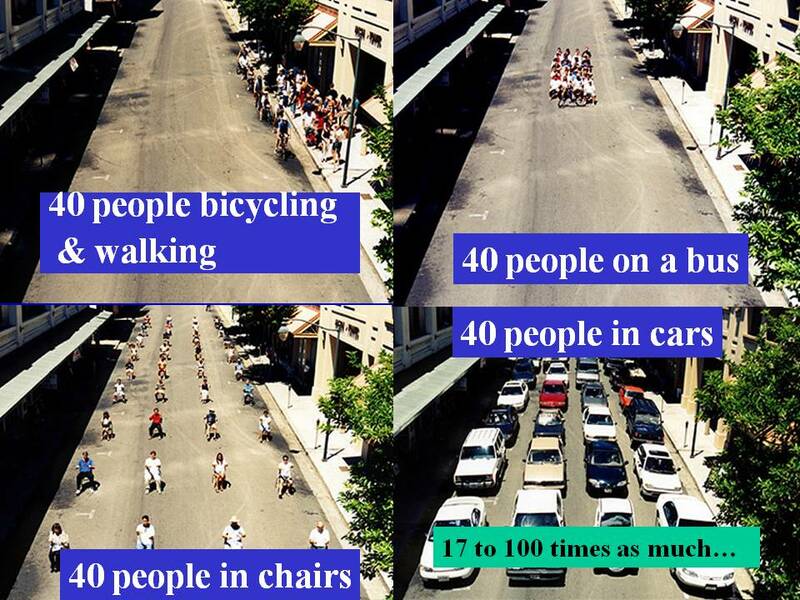 But doing so ignores the many other benefits: far fewer crashes and near misses, far less speeding, calmer traffic, less air emissions, better environment for businesses and homes, safer for walking, discretionary car trips are reduced, and more space for beautifying the street. The newspaper also runs a steady drumbeat of letters by folks who are SCREAMING about the catastrophic, 24/7 gridlock (I have been on the street all days of the week and all hours of the day and have seen no real congestion). The result is that many who read the letters are convinced that there IS 24/7 gridlock and therefore conclude that the project is an utter failure (and state they are no longer driving the road to patronize businesses). We lead extremely busy lives these days, so losing even 30 seconds on the road is utterly unacceptable. In Boulder, I have learned that nearly everyone (including those who should know better) has made the tragic mistake of equating free flowing car travel and easy parking with quality of life. That helps explain why opposition to density and tall buildings is so severe here (such development will crowd streets and parking, which therefore is a degradation of our quality of life). Forgotten, of course, are the many awful impacts of happy driving and happy parking. Happy driving delivers more sprawl, higher taxes, more strip commercial “sellscapes,” more injuries and deaths, reduced travel by walking or bicycling or transit, less affordability, more air pollution due to more of us driving, more huge parking lots and huge intersections and huge roads, and more noise pollution.